The True HEPA filtration technology in Sharp Air Purifiers is great for removing allergens such as dust, pollen, pet dander, and smoke from the air. In this video, watch as a chamber is filled with smoke before the Sharp Air Purifier is powered on. This real-time demonstration shows how effectively smoke can be removed from the air. Smoke is a great example because it’s easily seen, and smoke particles are similar in size to other common allergens. Look how quickly it works! Imagine how quickly True HEPA Filtration will remove allergens and dust from the air in your home. 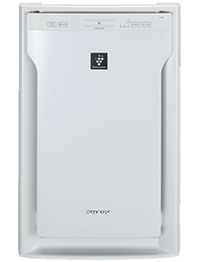 Find more air purifier information on the Sharp USA website. The Sharp FP-A80UW Plasmacluster Ion Air Purifier with True HEPA Filtration is ideal for large and extra-large rooms in your home. This air purifier model effectively reduces pollen, dust, pet dander, smoke, germs, bacteria, viruses, odors, mold, and fungus in your living space. There is a dual stage filter system including an activated carbon filter and long-life True HEPA filter, which captures 99.97% of particles as small as 0.3 microns from the air that passes through it. Patented Plasmacluster Ion Technology disperses positively and negatively charged ions throughout the room to safely break down microorganisms and odors (even those trapped in fabric, carpeting, and drapery!). It is an ideal solution for allergy sufferers, asthmatics, pet owners, and smokers, and best used in a bedroom, living room, study, or exercise room. There are 3 manual fan speeds. The air purifier unit has LibraryQuiet™ operation (as quiet as 29 decibels, or the sound of rustling leaves) and is ENERGY STAR® rated, so you can run the unit continuously while saving money and energy.